Delco Hi-Q is the oldest continuous academic quiz competition in the United States. Click here to nominate someone for the Delco Hi-Q Hall of Honor! 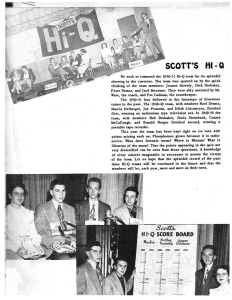 Founded in Delaware County, Pennsylvania, in 1948, the Delco Hi-Q competition began as a community relations program of Scott Paper Company, which was headquartered in the Philadelphia suburbs. The popularity and success of Scott’s Hi-Q prompted it to expand across the country to Washington in 1976, Wisconsin and Michigan in 1977, Maine in 1982, Arkansas in 1984, and Alabama in 1987. In 2004, seven years after Scott Paper merged with Kimberly-Clark Corporation, Franklin Mint Federal Credit Union (FMFCU) became the primary sponsor of Delco Hi-Q. Consistent with its mission to advance education, FMFCU is committed to promoting Hi-Q, supporting and recognizing academic achievement with the same manner of appreciation shown to athletes. The Delaware County Intermediate Unit provides program management and production support. 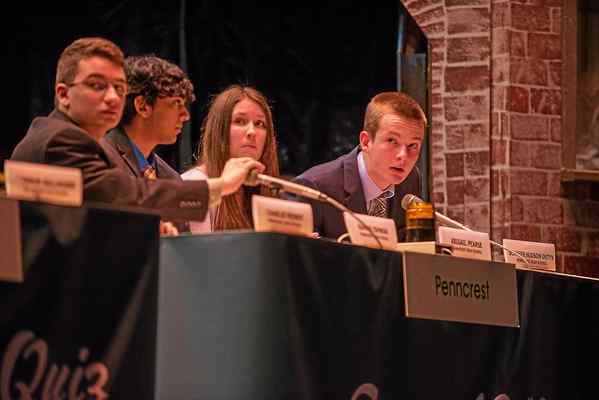 Twenty-one high schools participate in Delco Hi-Q. Each school team has ten members, and each school hosts one contest during the regular season. Three teams compete at each regular season match, and there are three rounds in each match. Questions, prepared from 14 subjects, cover standard high school course content as well as general scholastic knowledge that students are expected to have acquired. Guidelines and specific reference material are provided to each team at the start of each season. Each participating high school hosts at least one regular season Hi-Q match. Team standings are determined by total cumulative earned points. At the end of the regular season, the highest scoring team bypasses the semi-final round to advance directly to the championship round. Teams ranking second through seventh compete in the semifinal round before advancing to the championship match. Four of the six semi-finalists will be eliminated during the semi-final matches. The second highest ranking team competes against teams ranking sixth and seventh. The third highest ranking team competes against teams ranking fourth and fifth. 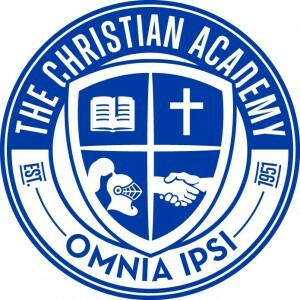 The two semi-finalists compete against the season’s highest ranking school for the championship. 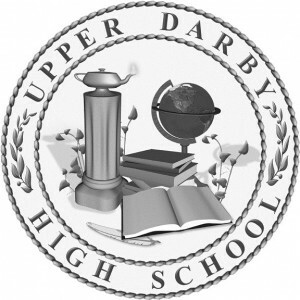 The winning team is awarded the coveted Donna Zerby Trophy and $3,000 for their school. Second and third place teams earn for their schools cash awards of $2,500 and $2,000 respectively. The Most Improved team also receives a cash award. All Delco Hi-Q teams are recognized at the annual Partners in Education Celebration, an awards banquet that highlights academic achievements in Delaware County and its neighboring communities. Participants are asked questions on a variety of subjects. Students are provided with a reference list before the start of each season. 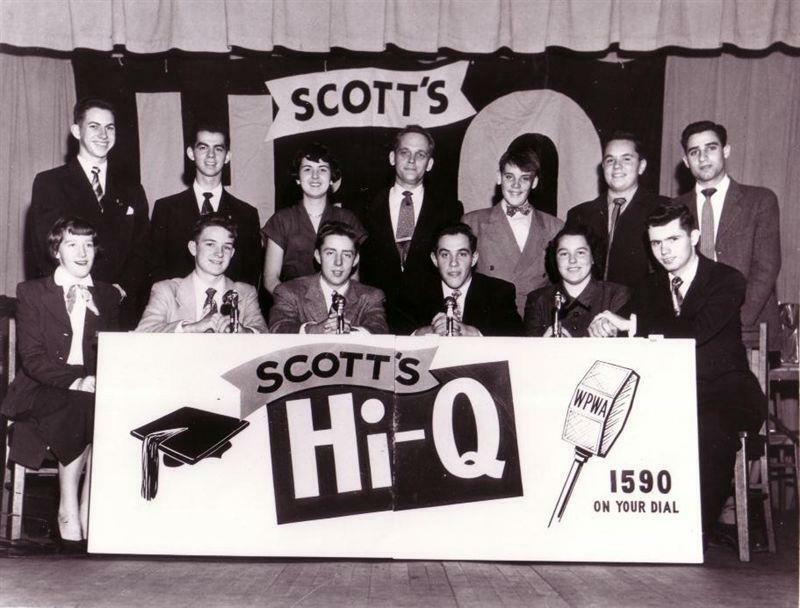 Early one morning in the summer of 1948, two Scott Paper executives, members of the newly formed public relations department, met to create a high school radio quiz program that would represent a constructive contribution to the youth of Delaware County, Pennsylvania, the base of Scott Paper Company operations. Through negotiations with Chester radio station WPWA, Scott’s Hi-Q was born. Robert O. Johnson, a young man with experience hosting quiz programs, was named quizmaster. Bob researched and wrote the questions, and also coined the name Hi-Q—“Hi” for high school and “Q” for I.Q. 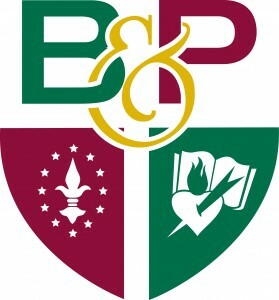 During the first season, 20 schools with teams of four students competed. A series of weekly contests, between two teams at a time, resulted in the selection of five finalist teams. All questions in that first year were based on the current issue of Newsweek magazine. 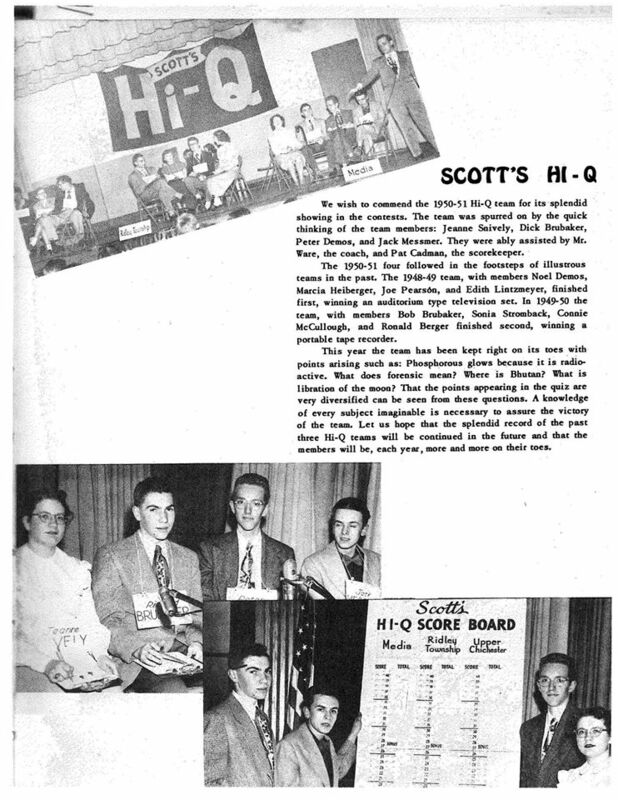 The first Scott’s Hi-Q competition was held October 13, 1948. 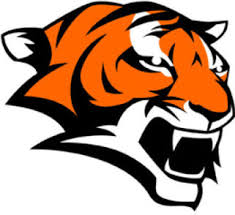 This history making event between Sharon Hill and Marple Newtown High Schools was recorded for broadcast on WPWA, a Chester, PA radio station. 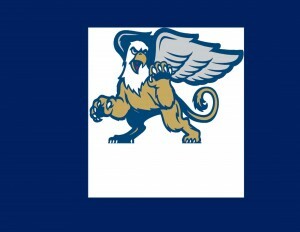 Sharon Hill High School was victorious. 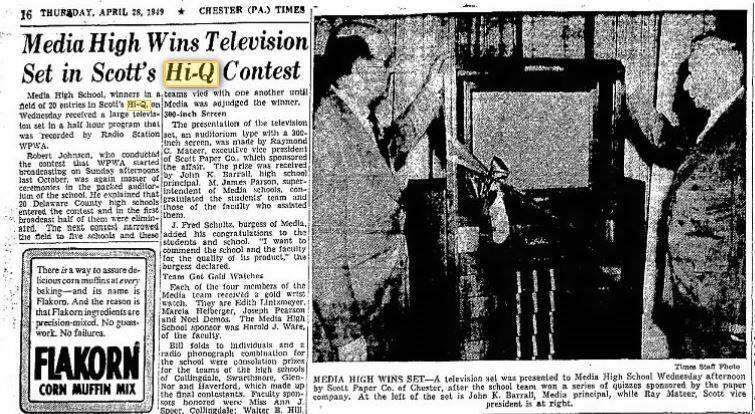 Media High School emerged as the first Hi-Q champion in spring 1949 following a competition with finalists Swarthmore, Collingdale, Glen-Nor, and Haverford High Schools. Each member of the Media High School Hi-Q team was awarded an engraved gold watch, and the school received an auditorium size television set. Second and third place winners received leather wallets and tape recorders for their schools. Hi-Q’s first season as a Current Events Quiz, proved to be not very exciting, so a format change was introduced. From 1949 through 1954, contest material was presented in the form of a fictitious story, containing a total of 20 errors. Students identified the error for one point, and corrected it for a second. The quiz was designed to test a general knowledge of history, geography, current events, literature, biography, science, and government. By 1954 it was decided to change the format using direct questions and a new scoring system. Minor changes in 1962 led to a similar format that is used today. 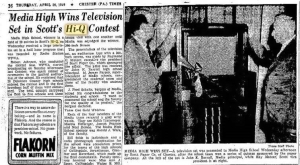 Eventually the radio broadcasts were cancelled as it became increasingly evident that Hi-Q was, and should be, an in-school activity, as much a part of school as classes, athletics, clubs, and all other elements that make-up the full high school experience. The program became increasingly popular over the years and in the 1970’s Donna Zerby, manager of Hi-Q and special projects, led the initiative to expand Hi-Q to other parts of the country. Having been involved with the program since 1962, Donna had the experience and passion to grow Hi-Q. Scott Paper plants in Wisconsin, Alabama, Maine, Washington, and Arkansas sponsored programs identical to the flagship Hi-Q. A national championship was also created during this period. As national director, Donna produced the program through the 1990s, and she continued as Delco Hi-Q director until her death in 2005. Through the Delaware County Education Foundation, local businesses began supporting Delco Hi-Q in the mid-1990s. Delaware County Intermediate Unit (DCIU) and the Foundation of The Delaware County Chamber of Commerce became co-sponsors of Delco Hi-Q. Today, Delco Hi-Q continues as a partnership between education and business organizations. The Delaware County Intermediate Unit, in conjunction with Franklin Mint Federal Credit Union, produces the competition. 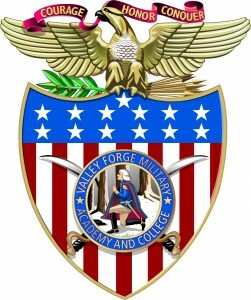 Partners In Education, a program of Franklin Mint Federal Credit Union Foundation, secures funding for Hi-Q, the annual academic awards celebration, and many related educational initiatives. Hi-Q is alive and well in Delaware County and in the states of Alabama, Wisconsin, and Washington. Hi-Q competitions are open to the public and free to attend. If you’d like to watch a match, simply register by calling the hosting school at least 48 hours in advance. The All-Delco Hi-Q Team is comprised of one outstanding student from each participating school. Formal acknowledgment of the best-of-the-best began in 2005. Franklin Mint Federal Credit Union, Delaware County Intermediate Unit, and The Delaware County Daily Times sponsor this exclusive recognition at the annual Partners in Education Celebration. The Delco Hi-Q Hall of Honor was created in 2005 to honor past Hi-Q participants and those who have made an outstanding contribution to the Delco Hi-Q program. The Hall of Honor will grow to include participants from each decade of Hi-Q. Please check back for information about nominating your candidate in 2019. 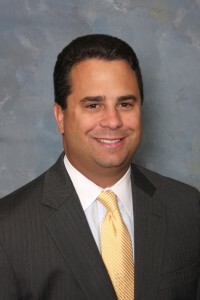 In addition to serving as the Director of Delco Hi-Q, Rick Durante is Executive Director of FMFCU Foundation, Vice President, Education at Franklin Mint Federal Credit Union, and serves on the Board of Managers of Credit Union Network for Financial Literacy, LLC Rick is also the current Board President of the Delaware County Literacy Council. Rick has been involved with Delco Hi-Q since 2004. In 2006, the National Youth Involvement Board recognized Rick for having the largest one-year increase in the number of students reached in financial literacy seminars. In 2007 he received an Outstanding Volunteer Award from the Interboro Education Association for bridging the gap between community and school. Rick is a Delaware County resident and a graduate of Interboro High School. He holds a B.S. in Education from Temple University. A native Philadelphian, Tom received his Bachelor’s degree from New York’s Niagara University. He studied locally with Rose Schulman at the Hedgerow Theatre in Rose Valley. Tom served on the faculty of the College for the Performing Arts at the New Studies Center in Philadelphia. In addition to national TV and feature film performances, Tom appears in plays throughout the Philadelphia region. 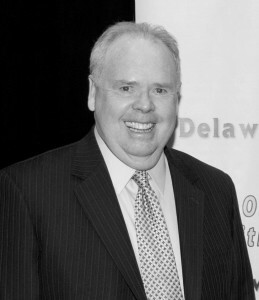 Tom was inducted into the Delco Hi-Q Hall of Honor in 2006. As a Corporate Social Responsibility Specialist at Franklin Mint Federal Credit Union, Danielle Griffin’s responsibilities include coordinating Delco Hi-Q, National Hi-Q competitions, and planning and executing Community Education events, including the prestigious annual Partners in Education Celebration. Danielle also cultivates partnerships and funding for the bouquet of programs offered through FMFCU Foundation. A lifelong Delaware County resident and graduate of Archbishop Prendergast High School, Danielle earned her Bachelor of Science degree in Business Marketing from West Chester University and has a professional background in fundraising and event planning.